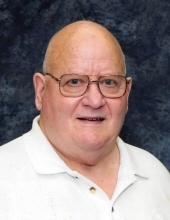 James “Jim” W. Steffen, 85, of Fond du Lac, died Friday, February 8, 2019 at the Fond du Lac Lutheran Home. He was born August 31, 1933 in Fond du Lac, the son of Raymond and Della Eickhoff Steffen. Jim graduated from Fond du Lac High School. He served in the U.S. Army from 1953 – 1955 and served in the Army Reserves until 1977. On September 28, 1957 he married Bonnie J. Hageman in Fond du Lac. He owned and operated Sky Port Shell and The Bug Haus. Later he was employed with Quad Graphics until his retirement in 1995. Jim was a charter member of Luther Memorial Church. He was a member of the Fond du Lac Motorcycle Club. Jim enjoyed deer hunting, fishing, woodworking, airplanes, and watching the Green Bay Packers. He is survived by his wife, Bonnie; two sons, Terry (Nancy) Steffen of North Fond du Lac and Thomas (Tanya) Steffen of Fond du Lac; one granddaughter, Samantha (Robert) Schmidkonz; sister-in-law, Pearl Steffen; nieces, Debbie (John) Myrechuck, Jackie (Joel) Spoon, and Jan (Ron) Chaney; and other relatives. He was preceded in death by his parents; sister, Betty (Eugene) Moore; brother, Bruce Steffen; and niece, Serena Loehr. The visitation will be held Saturday, February 23, 2019 from 11:00 AM – 2:00 PM at Luther Memorial Church, 134 21st Street, Fond du Lac. The memorial service will be held at 2:00 PM on Saturday at the church. Cremation has taken place and inurnment will be held at a later date in Ledgeview Memorial Park Cemetery. Memorials are appreciated to Luther Memorial Church or a charity of one’s choice in James’ name. The family extends a special thank you to Audra and Heidi from the Visiting Angels for their care and compassion given to Jim and his family while he was at home. To send flowers or a remembrance gift to the family of James W. Steffen, please visit our Tribute Store. "Email Address" would like to share the life celebration of James W. Steffen. Click on the "link" to go to share a favorite memory or leave a condolence message for the family.